A flash of red in the entrance to this cave caught my eye. It turned out to be a smurf on a garden seat. Au jardin hier: There was a Brimstone butterfly (Fr. Citron) flapping about, a couple of Dark-edged Bee Flies (Fr. Grand bombyle), a bumble bee (Fr. bourdon) queen (with a white tail, but I didn't get a good enough look to determine the species) and some Honey Bees (Fr. Abeille européene) and small solitary bees. The Glanville Fritillary (Fr. Mélitée du plantain) caterpillars (Fr. chenille) are starting to venture out and about a bit, but still together in their groups. The bee hotel that Kath made me has had an accident and its contents scattered on the ground. Either a squirrel has been jumping up and down on it or the wind has tossed it about. It has been taken over by Paper Wasps (Fr. guêpes), which I suppose is somewhat more convenient that the gatepost they occupied last year. I have my eye on one of the orchid leaf rosettes. It is clearly different to all the others. What species will it turn out to be I wonder? The Greater Stitchwort, Greater Star of Bethlehem (Fr. La Belle-d'onze-heures), Sweet Violets (Fr. 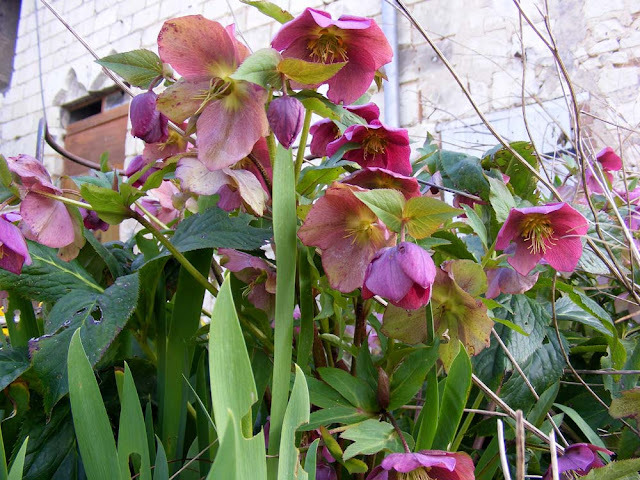 Violette odorante) and Primroses (Fr. Primavere) are all flowering. In the potager the 'spare' tulips are out and there are some escapee pinky purple Primulas in the grass. The blackcurrants have their first little leaves and the first asparagus spear is up. Sadly the asparagus doesn't thrive, so I never get enough spears to harvest, but it always sends up a few spindly efforts. The nectarines are flowering better than they have for the last few years so I am hoping for a good crop since they are amongst my favourites. It's still too early to tell though, and they often get caught out with dry weather later on. A la cuisine hier: Onion bhajis, which are one of the few deep fried dishes I am prepared to bother with. Smartraveller: I have finally registered us on Smartraveller. This is the Australian Government's website for Australian nationals who are currently overseas travellers and or expats. We were advised to register last year when I renewed my Australian passport in Paris. I've tried twice before but couldn't get the website to work. Yesterday it worked with no hassle at all. To register you need to have on hand your Australian and any foreign passport numbers for yourself and whoever else you are registering as part of your group. You will also need phone numbers and addresses for whoever you want to nominate as your emergency contact. You can register multiple people together and multiple emergency contacts. Although the online registration is designed for travellers rather than those who are resident in another country, the embassy advises that people like us register too. In certain situations, such as wars, natural disasters and major accidents it is useful if the Australian government can identify and locate its citizens abroad. This view of Preuilly was taken one morning recently. It's from near Laurence's bakery, looking across the valley of the Miloneau towards Notre Dame des Echelles. Portes Ouvertes: Clos Roussely is having an open weekend with a gourmet market on the weekend 2-3 April. They have the open weekend every year and it is quite lively and the producers high quality. Vincent Roussely, the winemaker, is presenting his new Touraine-Chenonceaux range. I tasted it the other day and it is excellent. I bought some red, €9 a bottle. The market will feature winemakers from other regions of France, oysters, honey, goat cheese, donkey milk products, mushrooms and traditional biscuits. You can also have lunch there. 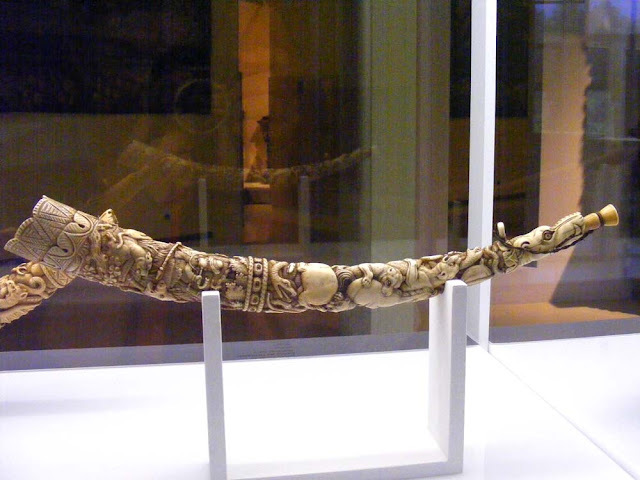 A 16th century carved elephant tusk on display in the Castello Sforzesco. We have changed the look of the blog. It's been three years since we last did so. Yup - it's greener. 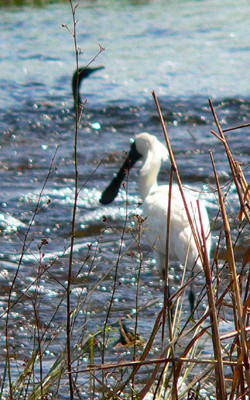 The Royal Spoonbill Platadla regia is a bird of Australia's wetlands, both saltwater and fresh. 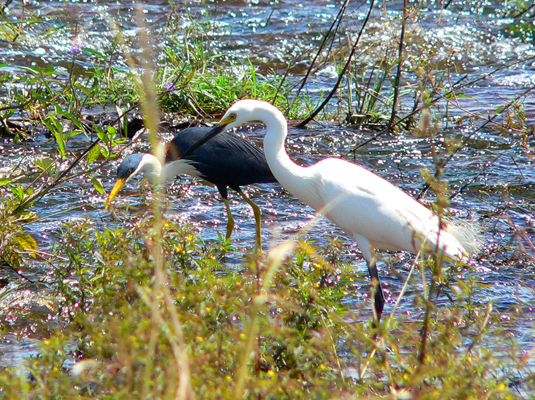 They feed by swishing their spoon shaped bill through the water, picking up small crustaceans, fish and insects. This one is in breeding plumage, with long plumes on the top of its head. In the photo they are laying down and loose, but they can be raised like a crown. It was photographed at Fogg Dam in the Northern Territory. The bird in the background looks like some sort of cormorant. 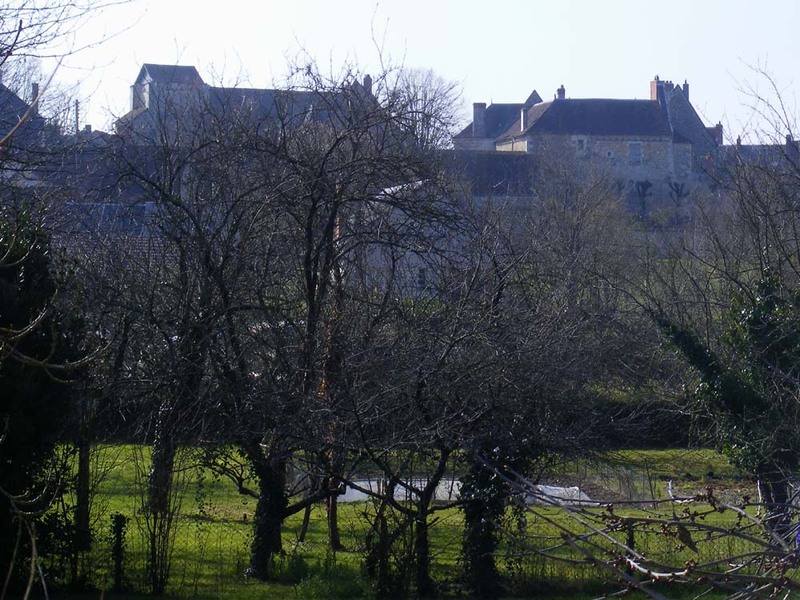 The Miloneau is a tiny stream that runs from the Chateau of Fontbaudry, through Preuilly until it reaches the Claise. 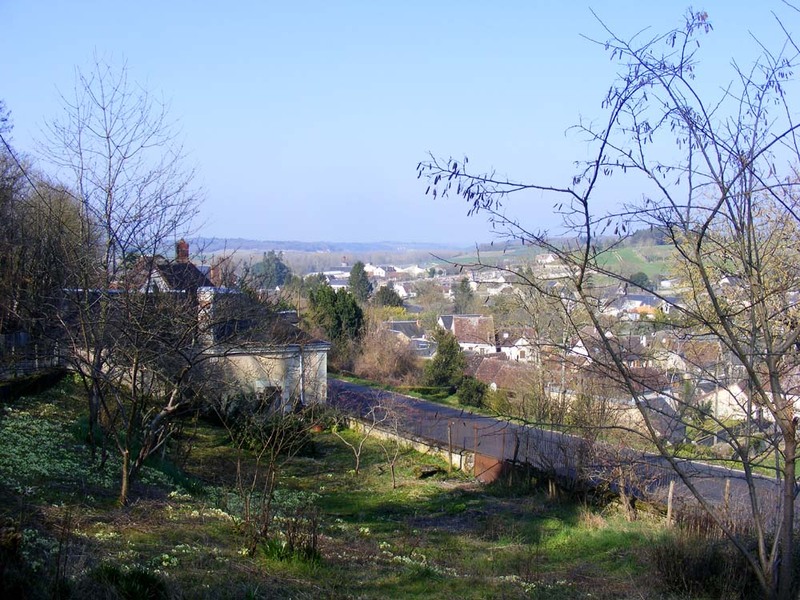 This is the view looking up the valley it runs through, from the Route de Loches towards Fontbaudry. Although we like doing the old car thing (actually, we love doing the old car thing!) we are by no means the most energetic or completionist of adherents. We are starting to get a 1950's style wardrobe together, along with a bit of vintage luggage and an accessory or two, but there is much room for improvement. One thing that I really like the look of is retro-camping, a seriously organised nation-wide series of events for enthusiasts. Retro camping can be done under canvas in a 1930's style open car and canvas ex army tent, all the way up to a Citroen DS towing a mid 70s fibreglass caravan (with orange interior, naturally). 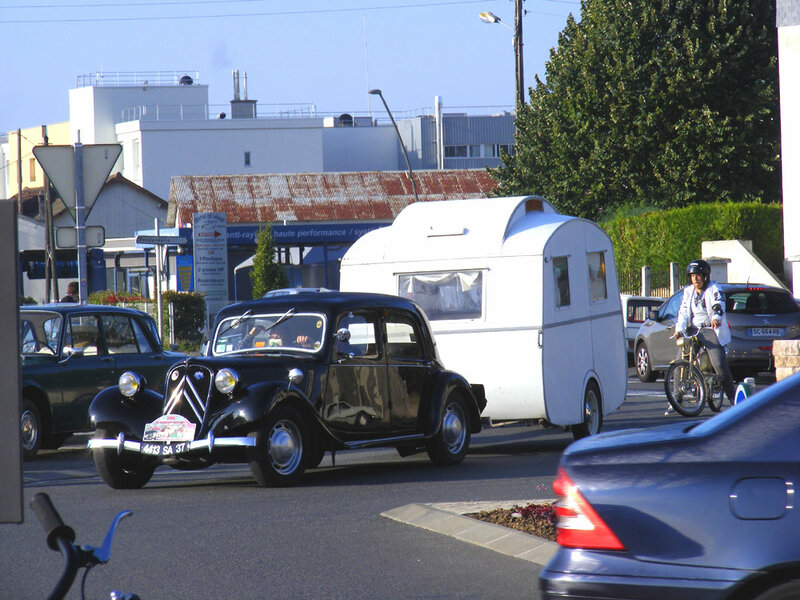 We first encountered retro-camping as visitors to the le Grand Pressigny campsite in 2009, just after we bought Célestine, and at the time thought it looked a bit of fun if weird. We also encountered it when at le Mans (we were camping, but not retro stylee) and at the Ste Maure traffic jam. Now, I want to try. Having watched this program on French TV a couple of weeks ago, I have decided it looks like the best road trip holiday one could have in France. 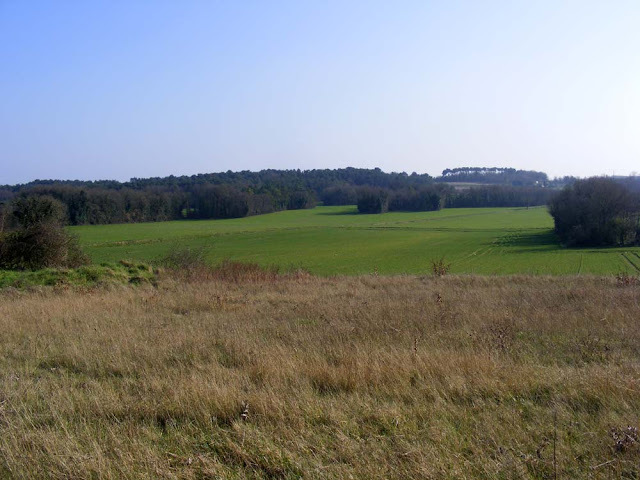 So if all goes well, maybe this summer we will head off on holiday in one of les grandes dames. 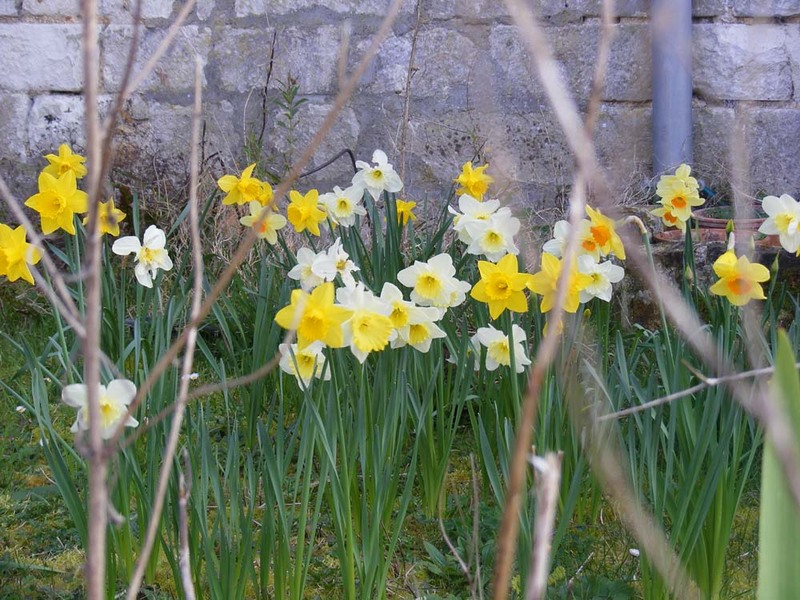 Some photos of the flowers in our back garden just now. A la cuisine hier: Tongue, which I had previously brined, then cooked on the wood stove, as tongue needs hours of super slow cooking. I made Sauce Gribiche to go with it and served it with lentils (from a can) and some boiled vegetables. Dessert was an experimental concoction involving cake, raspberries, chestnut puree, almond cream and chocolate. Simon rated the meal as 'magnificent'. I was very pleased with how it all turned out too. Au jardin hier: 'Our' swallows have arrived and have been checking out the garage. Simon heard a cuckoo while he was hanging out the washing. The other day I found a Great Silver Beetle Hydrophilus piceus on the footpath outside the college in Preuilly. It was distinctly poorly and I assume had been hit by a car. 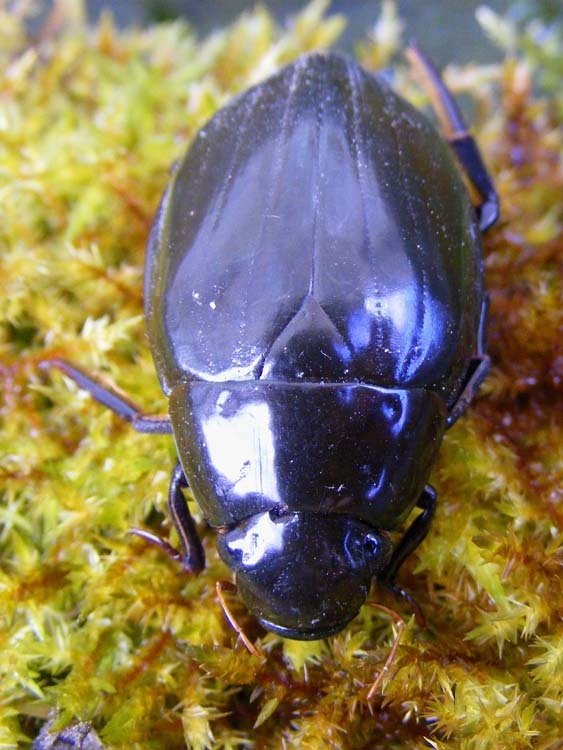 Great Silver Beetles are aquatic and out of the water a dark olive green. In the water however, they are enclosed in a bubble of air which makes them look like quicksilver. The beetles are covered in fine hairs which trap the layer of air. 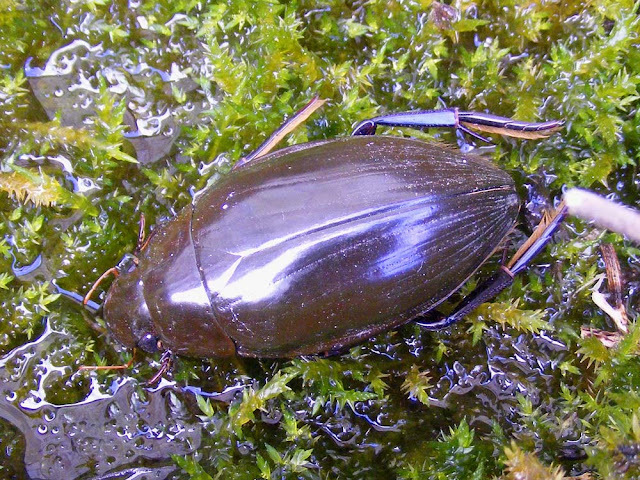 There are two families of large aquatic beetles, the Dytiscidae and the Hydrophilidae. The way you can tell them apart is that Hydrophilidae have a very prominent pointy keel running between their legs. 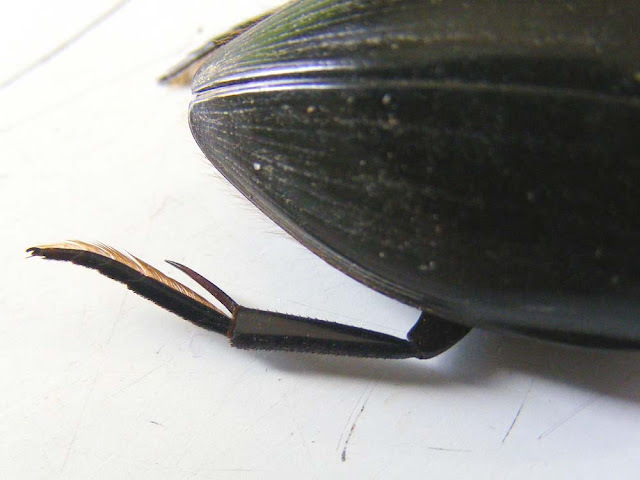 Their shape is streamlined and their legs feathered, in order to move through the water. Despite their rather predatory appearance they are mostly omnivorous scavengers (although they will tackle water snails). 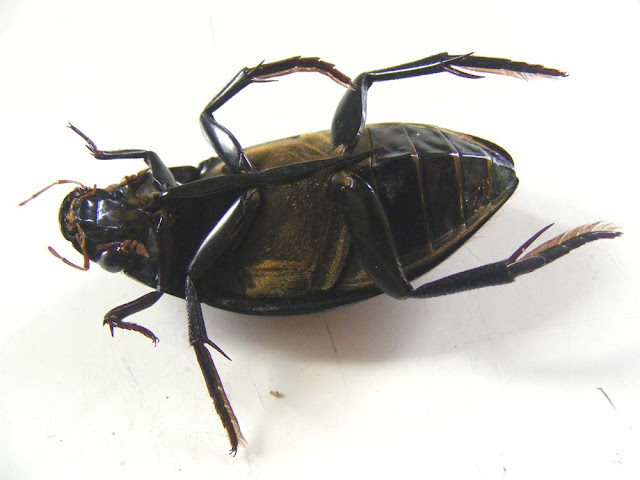 They are amongst the largest beetles in Europe and this one measured 5 cm long. It's female. 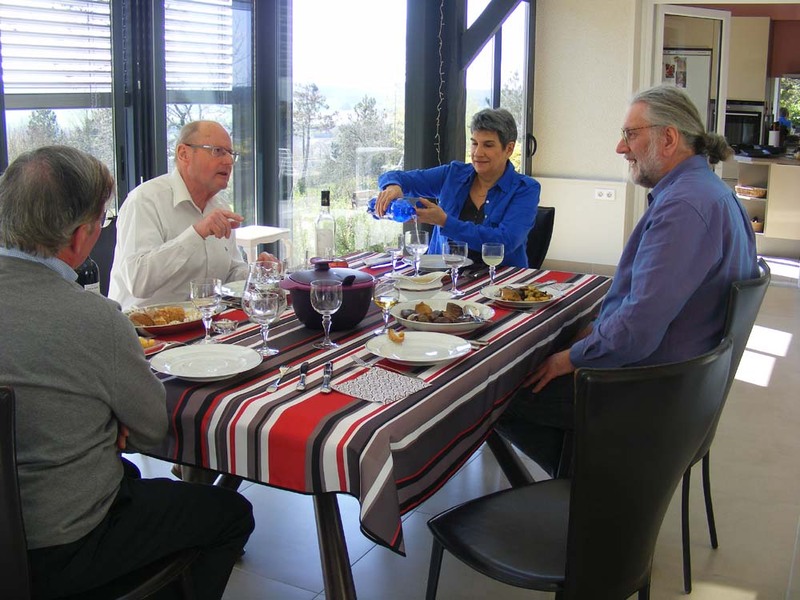 Last Thursday we went to lunch at our friends Alain and Bernadette's. They live on the hill overlooking Preuilly. They bought the house when they retired a couple of years ago. 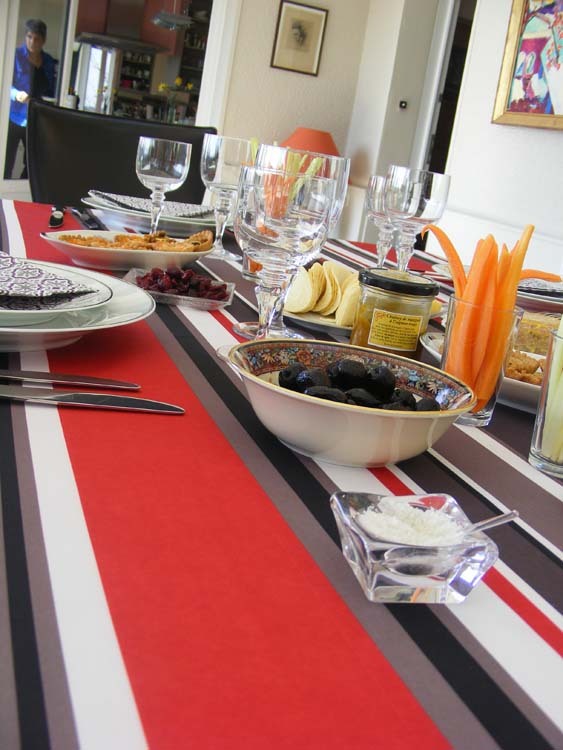 It's a great location, and we lunched in the fabulous conservatory (Fr. veranda) they added to take advantage of the view at the back of the house. Lunch had a south-western theme, based around duck. Alain is originally from Loches, but Bernadette's family comes from further south, where duck fat rules in the kitchen. On the table when we arrived was a selection of nibbles and a terrine with a foie gras centre, which had come from local producers Maison Perrin. Alain opened a bottle of Loupiac to go with the starters. Loupiac is a tiny AOC that we had never heard of, in the Bordeaux region. They only make sweet wine (Fr. liquoreux), but nowhere near as sweet and syrupy as their sister AOC Sauterne. I liked it, and it was interesting to have something different. 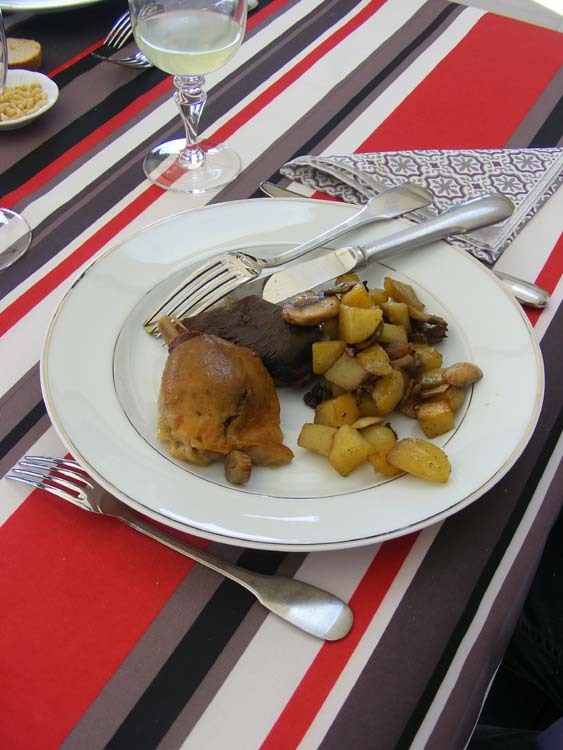 The main course was confit de canard with potatoes and mushrooms. Some clarified duck fat was served in a gravy boat and the wine was a Bordeaux. Duck fat was pronounced 'good for you' and we discussed the different sorts of mushrooms one might forage for this dish. Bernadette said that when she was growing up ceps were the main mushrooms the family foraged and they really only ate those or button mushrooms (Fr. champignons de Paris) and maybe the occasional girolle. 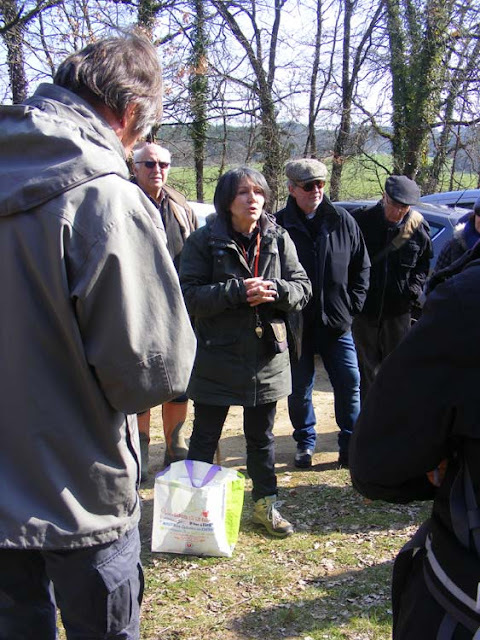 Now she lives in Preuilly she has discovered Hedgehog Mushrooms (Fr. pieds de mouton), which she really likes. 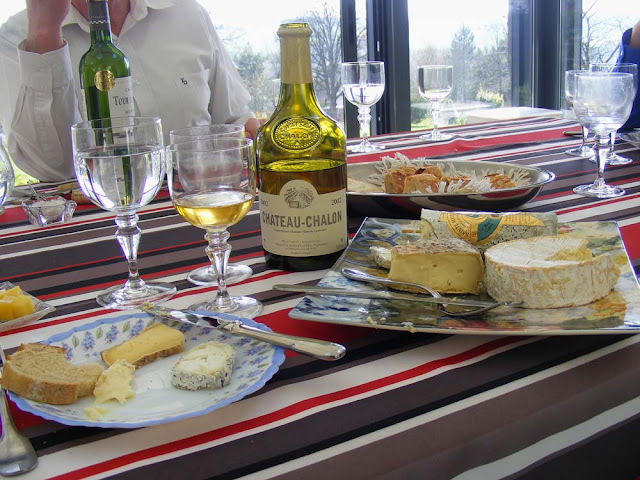 The cheese course was a farmhouse Saint Nectaire, a Sainte Maure de Touraine (local goats cheese) and a camembert. Gérard, who was the other guest, had brought a most unusual wine to go with the cheese. It was a 2002 Chateau-Chalon. This is one of the late harvest wines known as vin jaune ('yellow wine') because of its golden colour. It comes from the Jura mountains and is always bottled in the distinctive shaped bottle you see in the photo. The wine cannot be bottled until it is aged for six years and three months. It is matured in wooden casks which are never filled to the top. The wine develops a film of yeast which gives the end product a very distinctive flavour. You would be forgiven for thinking this is a fortified wine, and apparently the yeast is very similar to the one which develops on maturing sherry. I thought it went fantastically well with the cheese, and was especially perfectly matched with the Saint Nectaire. 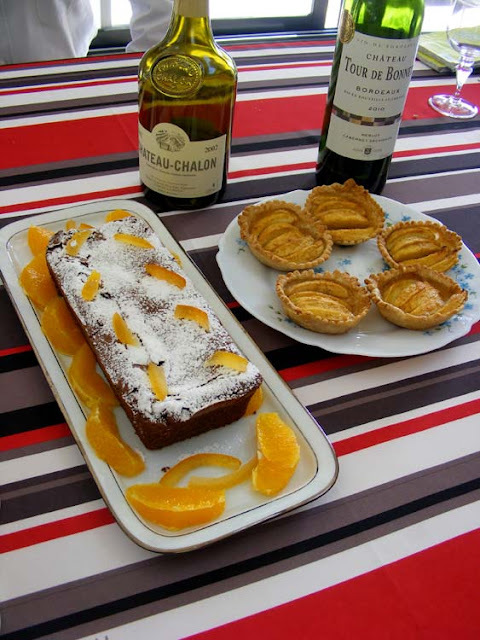 Finally there was a chocolate Grand Marnier cake and some apple tartlets. Lunch started at 1 pm and we were still at the table at 6 pm. The gathering only broke up because Alain and Gérard had to go to a meeting. It was a thoroughly enjoyable meal and the nicest company you could possibly want. 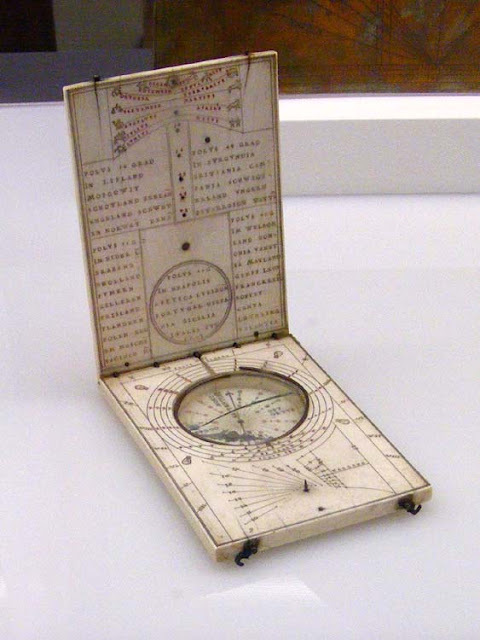 This object on display in the Castello Sforzesco is an ivory and gilt brass pocket sundial and compass made by Hans Ducher of Nuremberg in the second half of the 16th century. A la cuisine hier: I hesitate to say that we have a surfeit of cheddar, because I don't want to discourage our English friends from bringing over for us periodically. However, I needed to use up some milk, and we currently have quite a lot of cheddar lurking about (just over 2.5 kg) so I thought some Cauliflower Cheese was in order. As I only had a small cauli, and other veg to use up, it was cauliflower, broccoli, zucchini and carrot in cheese sauce, topped with breadcrumbs and parmesan. Dessert was stewed peaches from the freezer. Lunch was cold corned beef sandwiches. 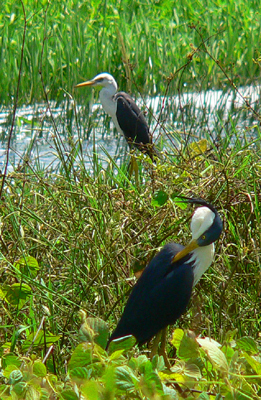 These elegant birds are a Pied Heron on the left at the back and a Little Egret on the right at the front. They are both adults in breeding plumage. Above there is an immature Pied Heron on the left at the back and an adult on the right in front. Below there is an immature Pied Heron at the back, a Little Egret with outstretched wings on the left and two adult Pied Herons. All photos taken at Fogg Dam in the Northern Territory of Australia. The Little Egret is the same species (but different subspecies) to the one we get here in France. A la cuisine hier: Home cured Corned Beef, boiled with potatoes, turnip, parsnip, carrots and cabbage. It turned out very well, with very much the taste and texture of the corned beef one can buy at the butcher's in Australia. Au jardin hier: The nectarines are flowering. I saw a bumble bee and several Early Mining Bees as well as a few Honey Bees and some tiny solitary bees, so the pollinators are out and about. The Wall Lizards were also enjoying the sunshine and a frog plopped into the stream. I pruned and tied the grape vines and sowed buckwheat and black medick as green manure and pollinator attractors. The buckwheat seed box says on the back (my translation): "Buckwheat, with its well developed root system, provides lots of organic material. 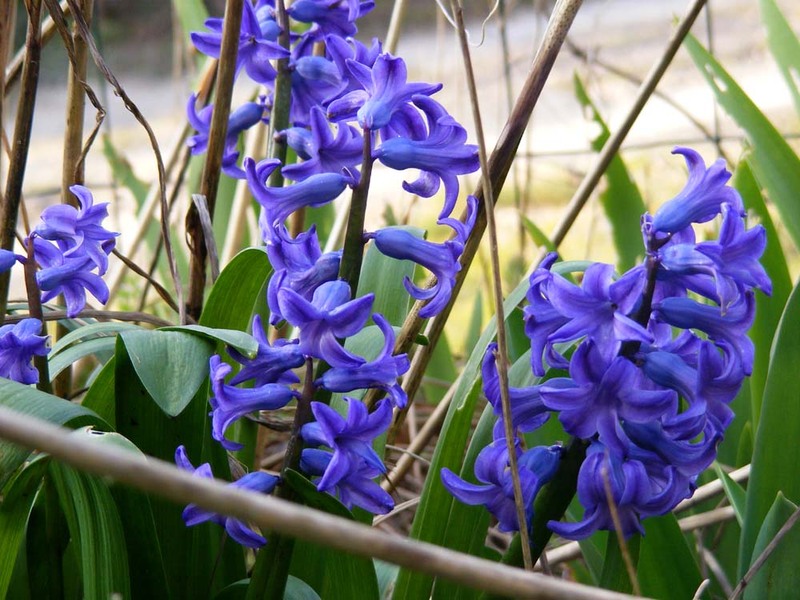 Its rapid growth allows it to limit undesirable plants. Melliferous, because very rich in pollen, it encourages the presence of numerous useful insects in the garden, such as bee flies which devour aphids in the thousands." Great, except that bee flies are more likely to smile and politely wave at aphids than eat them. Despite their strapline of 'nature est notre métier', Gamm Vert, who retail the seeds under their own brand, clearly can't tell the difference between une bombyle (bee fly) and une syrphe (hover fly). As it happens, there was a bee fly in the garden too -- the Dark-edged Bee Fly, always the earliest to appear in the spring. 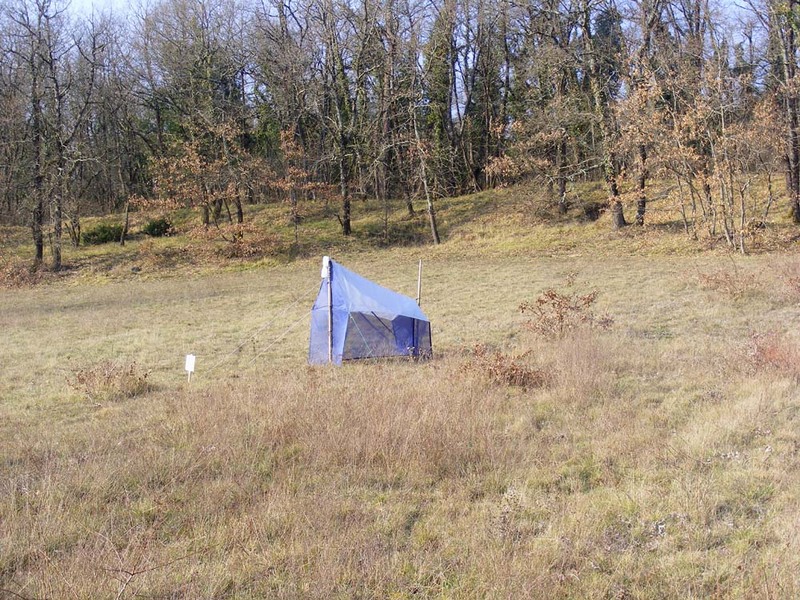 The Puy Besnard, a dry limestone ridge near Chinon, is a nature reserve run by the Regional Nature Conservancy that the Association de Botanique et de Mycologie de Sainte Maure de Touraine visits at least once a year. 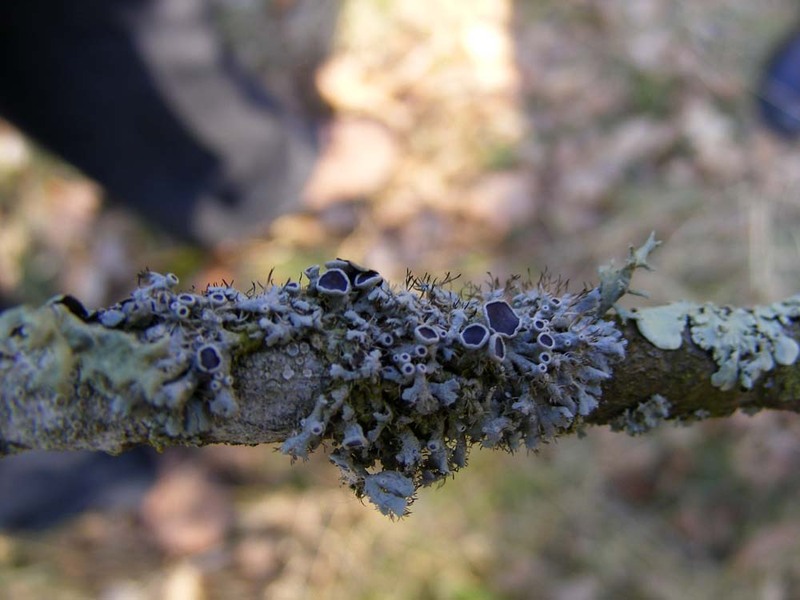 This year it was on Sunday 13 March and it was to look at lichens. The outing was organised in conjunction with the Ecomusée du Véron. 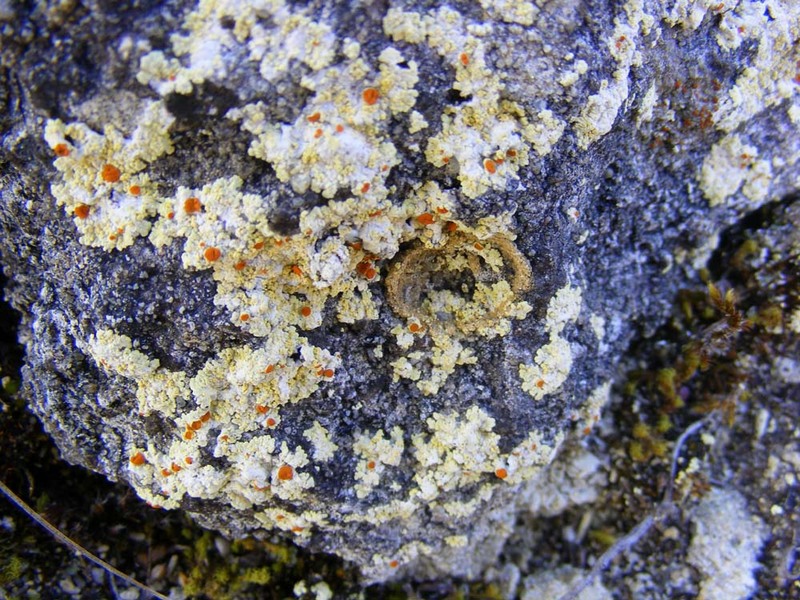 Lichen is not one but two organisms, living symbiotically. 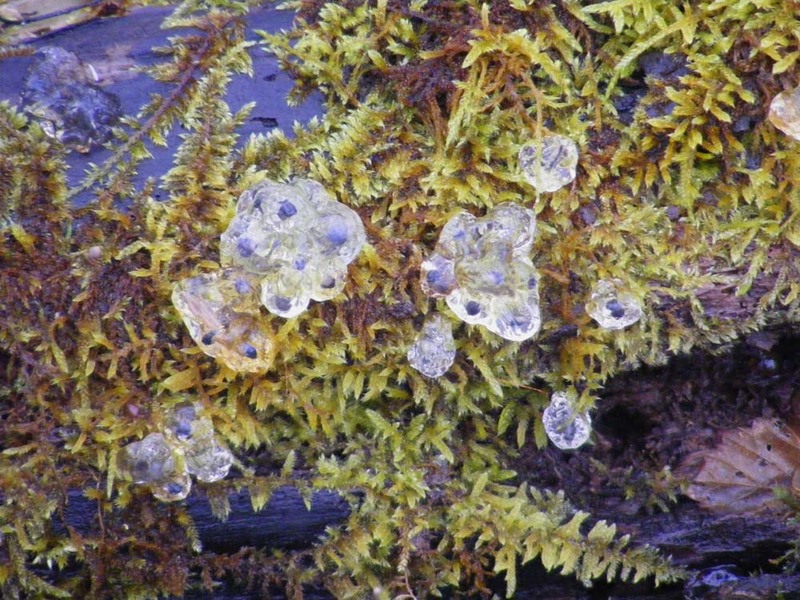 A fungi captures an algae or a cyanobacteria and protects it from dessication. The two organisms are then able work together to extract and share nutrients from their environment (they photosynthesise). 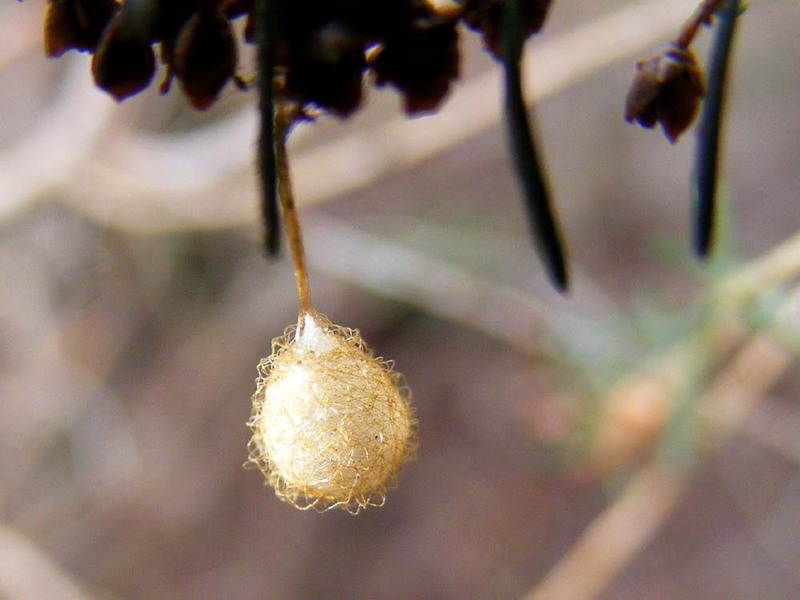 Many species grow on trees, but they are not parasitic. They come in many physical forms, from flat and leafy and tiny multi-branched tufts to crusty growths, powdery dustings and blobs of jelly. 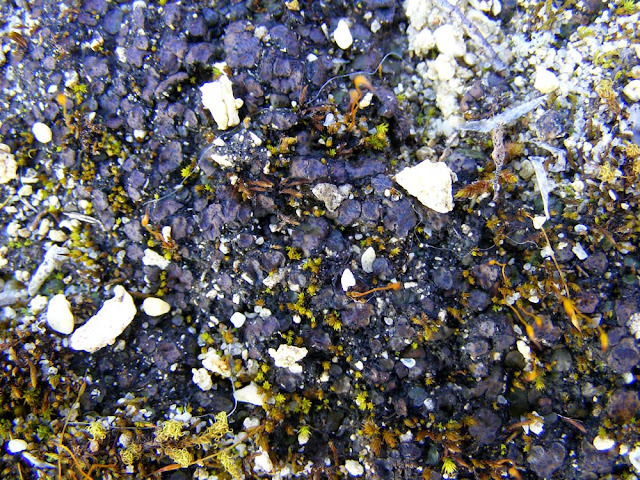 dry limestone sites, growing on the ground. 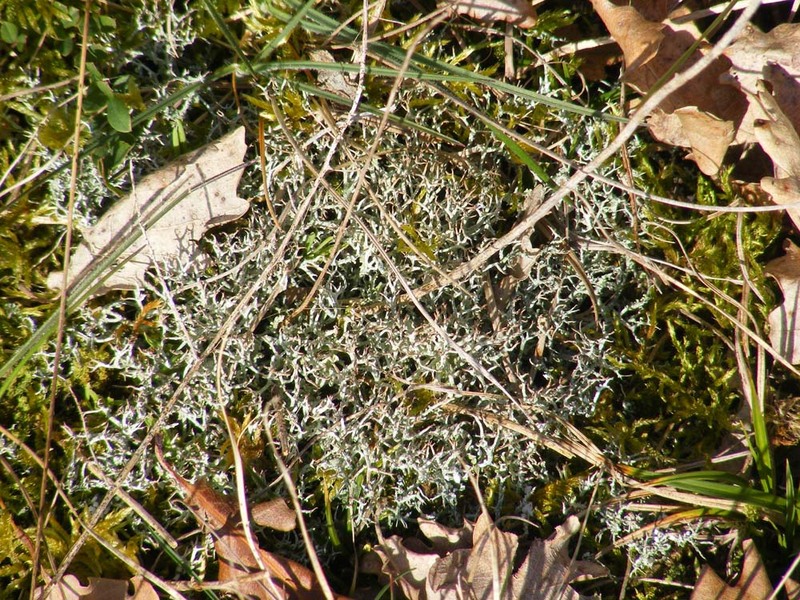 Despite its English name it is not a moss. 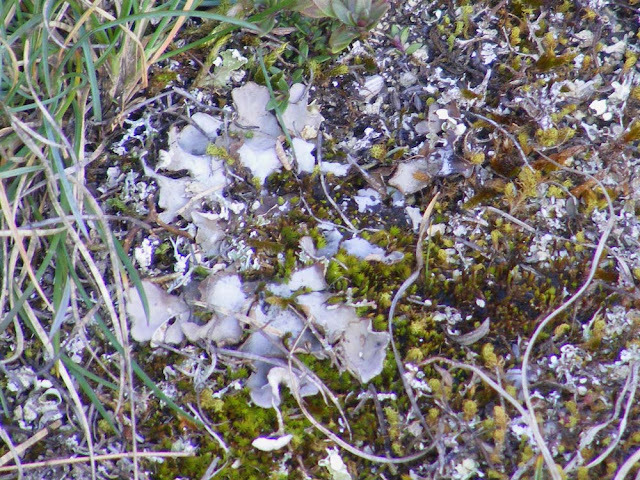 Field Dog Lichen Peltigera rufescens (below). The ash grey colour tells you it is dry. It is a locally common species of well drained calcareous soils. Placidium squamulosum (below) a widespread but localised species of calcareous soil and rock crevices. It looks just like dirt. Marie-Claude could spot it from standing a couple of metres away. I had to get down on my hands and knees with a loupe. Scrambled Egg Lichen Fulgensia fulgens (below) a rather uncommon species that grows on exposed chalk or limestone, usually amongst a moss, where there are no competing plants, but this one is going it alone on a piece of limestone in full sun. The view from the sunny slopes of the Puy Besnard (below) looking south. looking at the ground. They've been seduced away by a fungi on a stump. a lichen of slightly base pH bark. Below, a malaise trap set up to catch insects. The Conservatory is creating an inventory of the insect species on the site and by extension for the departément of Indre et Loire.The insects come flying across this sunny clearing and hit the vertical screen. Their instinct is to crawl up the screen. When they reach the top the slope of the 'roof' directs them to the front corner, where they will fall into the alcohol filled collecting bottle. This trap looked brand new, fresh out of its packaging, so it seems like some lucky person has got some funding to do some actual science. Mostly this trap will be catching flies, bees and wasps. 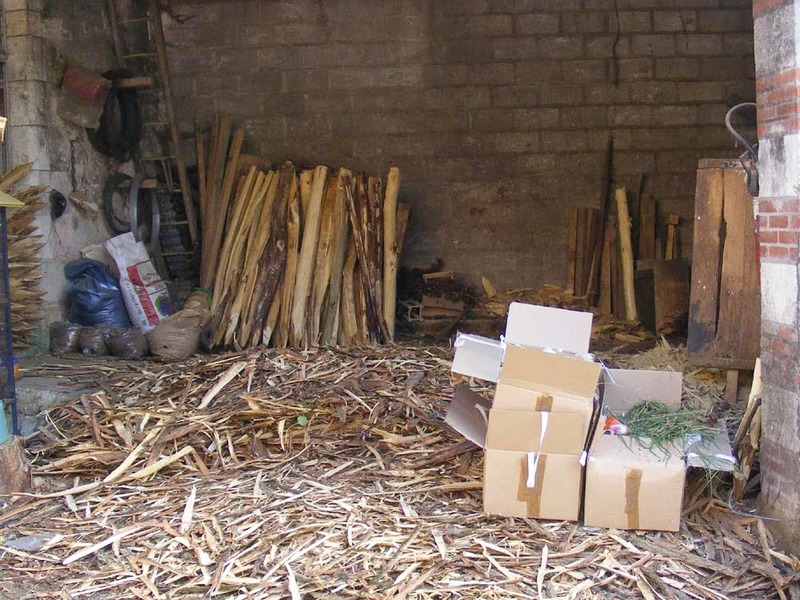 This time last year Christophe Davault from Domaine de la Chaise was busy making dozens of vineyard stakes. 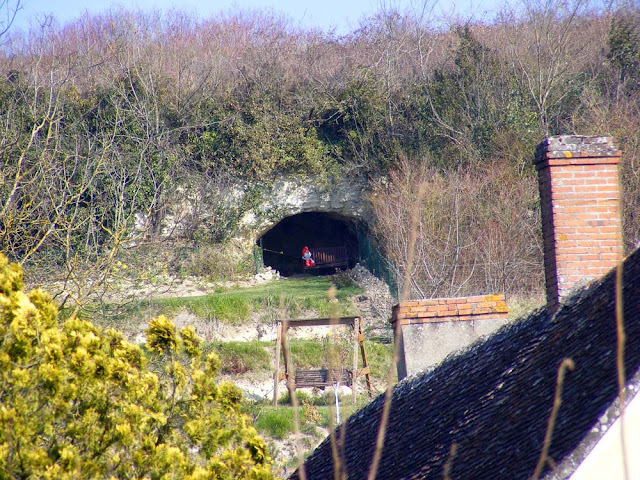 You can see how they are used in the vineyard in this post about the nearby vineyard of Clos Roussely. The vines are pruned and vine supports renewed over the winter. In fact, talk to any winemaker and they will tell you that winter is the busiest time of year for them. That's quite a lot of kindling too. Tableau Noir: A couple of nights ago we watched a documentary on TV5Monde about a little one teacher school in the Jura mountains. It was called Tableau Noir, which means 'Blackboard'. If you have intermediate or better French I highly recommend it. Gilbert Hirschi, the teacher at the school for 41 years, is wonderful. The children are an absolute delight and the film maker has done a fabulous job of capturing them behaving naturally. Sadly, the documentary is the story of the last year of the school's operation, and it closed a couple of years ago. Tears all round at the end. It got a special mention at the Locarno film festival in 2013. I can't find it in full on line, but Gilbert Hirschi tells you where you can purchase it on DVD in the comments after the promotional video on YouTube. Brexit: If you are British and living elsewhere in the EU, please make sure to register to vote in the upcoming referendum to decide whether or not Britain withdraws from the EU. It is easy to register as a UK voter living abroad and easy to apply for a postal vote. It just takes a couple of emails. The information you need to register is here. As British citizens* we currently have the right to live and work anywhere within the EU. What would happen if Britain withdraws is anyone's guess, but it will undoubtedly be a pain in the neck at the very least for those of us established in France but without French citizenship. *We have dual Australian and British citizenship. 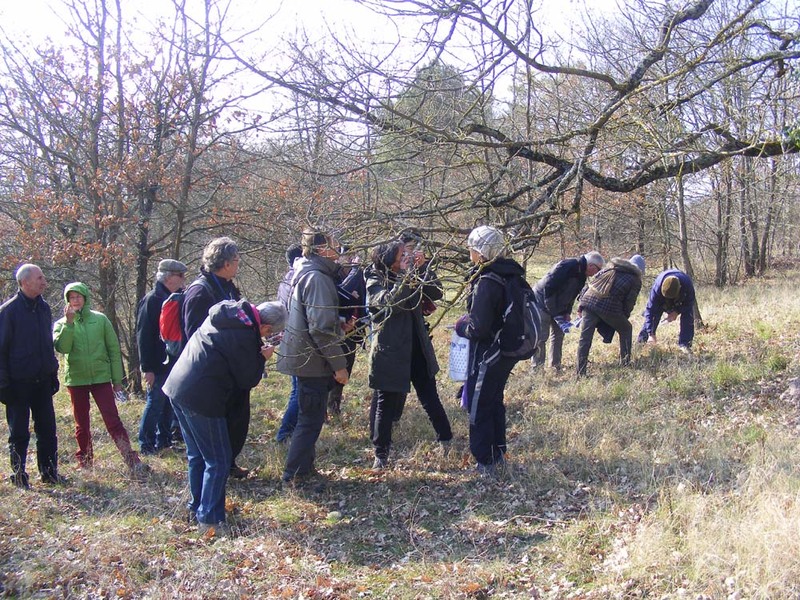 The Association de Botanique et de Mycologie de Sainte Maure de Touraine had an outing to the Forest of Montgoger on Saturday 5 March. We were promised 'une promenade botanique et autres curiosités'. I expected the 'curiosities' to be manmade, but they turned out to be entirely natural and a function of this old, and until recently, abandoned forest. Oak trees, still bare of leaves in March. The forest was once the hunting domaine of the old Chateau of Montgoger, a stonking great early renaissance structure, now a ruin, but retaining its exterior walls and round corner towers to a considerable height. 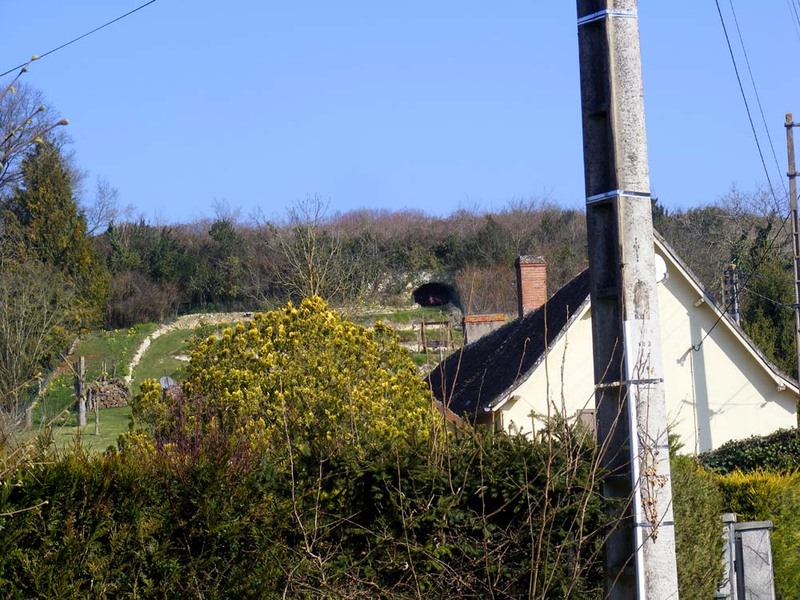 It is visible from the road as you head towards the forest from Saint Epain. 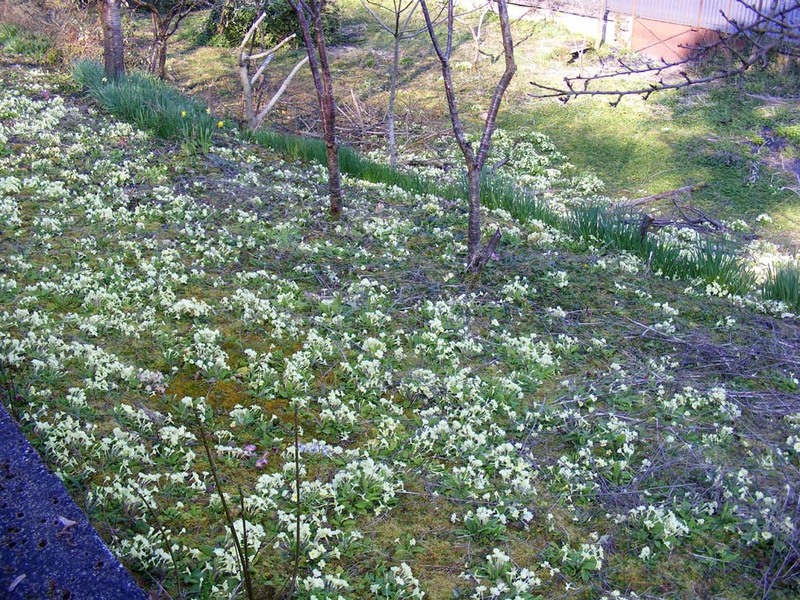 a form that is highly desirable for biodiversity. by a dead oak, which it will replace. 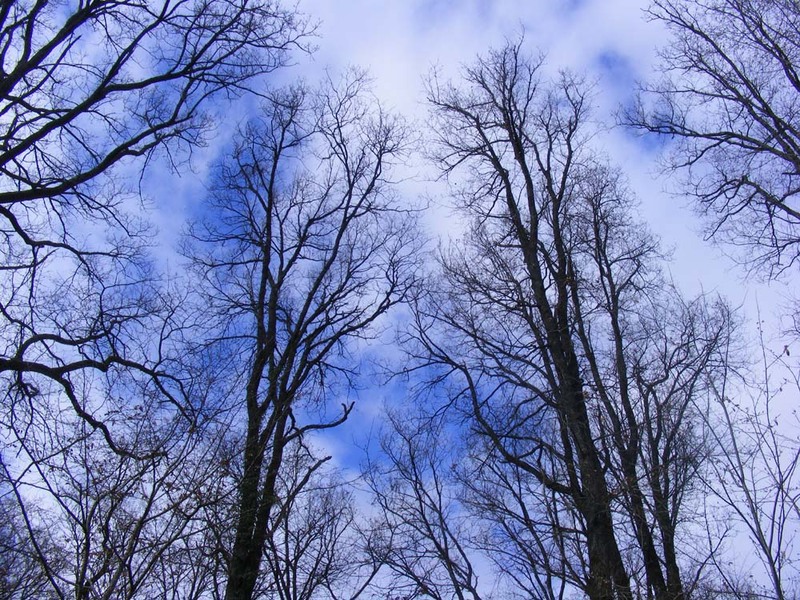 It is now owned and managed by the Office National des Forets (ONF), who are currently in the process of encouraging the forest's 1.66 km² to naturally regenerate after purchasing it in 2009. Effectively, they are managing the forest for biodiversity, not timber, hunting, leisure or any of the other activities one might manage a forest for. As a consequence of a complete lack of management for years and a very light touch by the ONF, Montgoger has many mature oaks with dead and horizontal branches, as well as many dead trees both standing and fallen. This is perfect for the big beetles whose numbers are generally in decline because of insufficient suitable dead timber. Some of them are surprisingly picky, requiring a specific species of tree, or dead branches on a still living tree, for example. Many forests are way too tidy to suit those beetles that need years as a larva to mature -- their lovely rotting home will get cleared up long before they have a chance to turn into adult beetles. UPDATE: Chantal, who led the outing, has emailed me to say that she deliberately kept to the untouched sections of the forest, but in fact, hunting is allowed once a week during the season and timber is taken from certain sections. 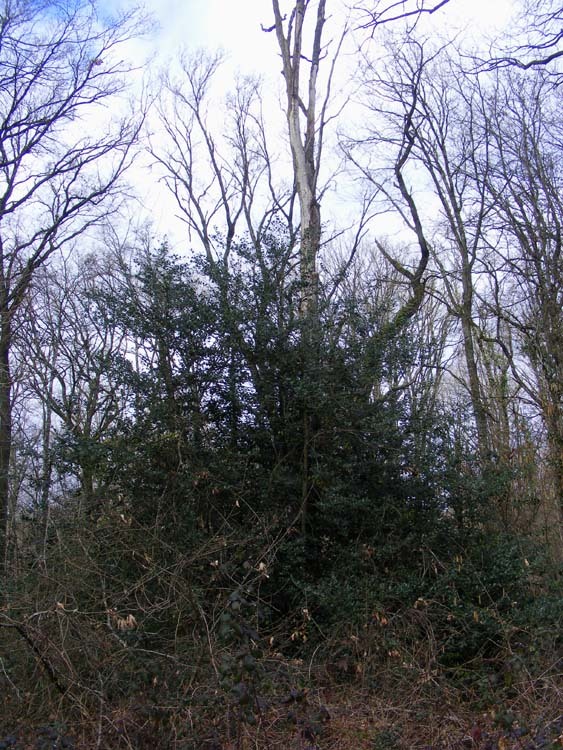 She sees signs of wild boar sometimes where they have rooted around trees and the hunters paint the base of certain oak trees with pine tar as the smell attracts the boar. She also occasionally finds the remains of corn cobs. 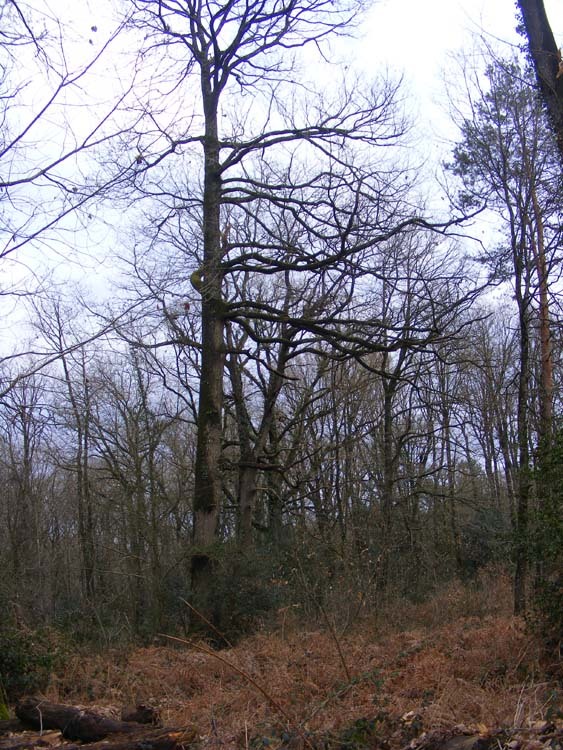 About 10 years ago some of the oak from this forest went towards making the replica of the Hermione, the ship that Lafayette sailed to the US in when he went to aid the Americans in the War of Independence in 1780. The eggs of an Agile Frog, near, but not in a pond. Has it been so wet the frog got confused? The forest sits on a rise overlooking the small river Manse. 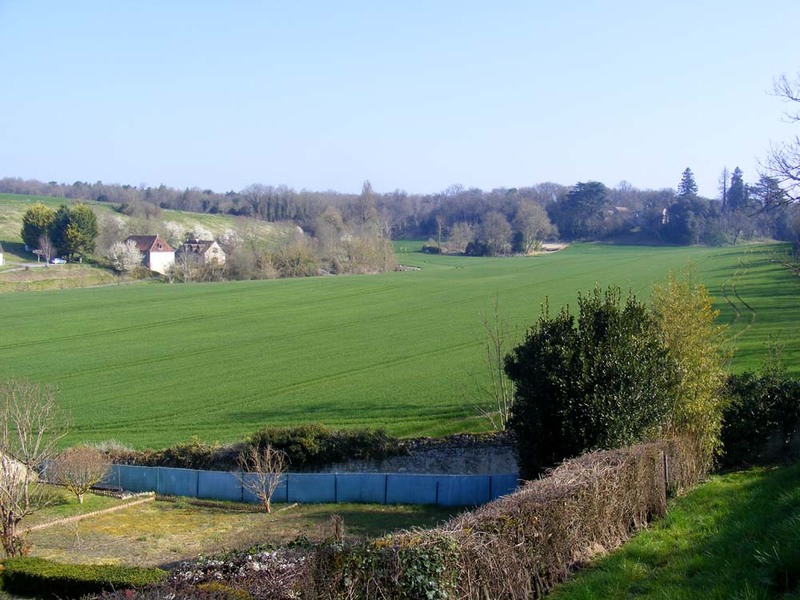 The valley of the Manse is the most typical Touraine countryside you could possibly hope to see, and the mosaic of habitats it offers (forest, water meadows, limestone cliffs and ridges, ponds and marsh, pasture for goats and cattle, cereal crops and vineyards) is the subject of an ongoing botany project to create a complete inventory of the flora of the valley. The river Manse eventually flows into the Vienne at l'Ile Bouchard. 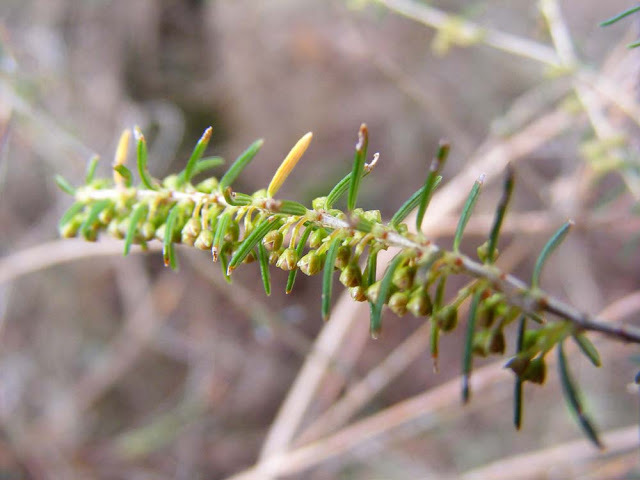 The inconspicuous flowers of Besom Heath, a plant which dominates the wet heathland here. Corinne pointed this delightful little object out to me. It is an egg sac, I think belonging to the pirate spider Ero aphana. 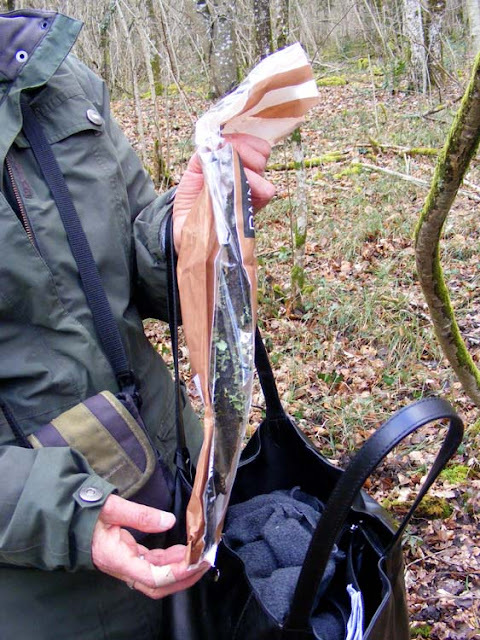 Marie-Claude demonstrates her baguette bag as lichen sample on stick storage system. Two members of the club have uploaded their photos from the day onto their websites. To see Louisette's terrific coverage click here. You will see me in a couple of the photos, and I highly recommend her blog (you don't need to read French because it's photos). André has also uploaded his photos of the day. He's also captured me in a couple of his photos. I'm wearing a green hat and coat and fingerless gloves. Au jardin hier: Alex came over to rotovate one of the fallow vegetable patches. The Lady Orchid leaf rosette is up. The apricot is flowering. 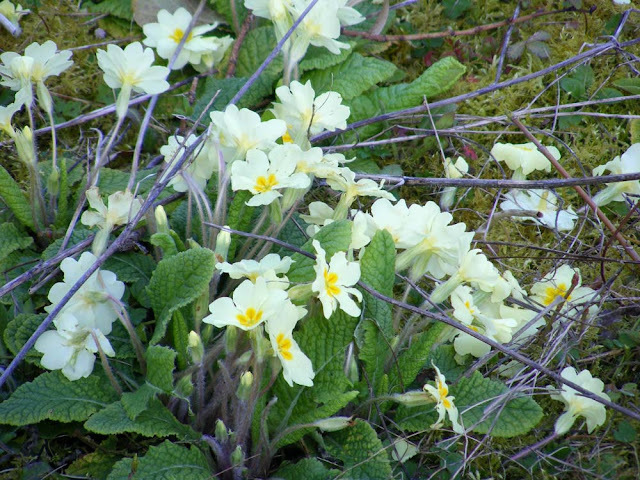 Primroses, sweet violets and wild pansies are flowering in the grass. A la cuisine hier: Garbure, with smoked pork belly and shredded chicken, celeriac, potato, carrots, leeks, onions, garlic and cabbage in homemade veal stock. It was rather good. Pasta twists in a simple homemade store cupboard tomato sauce, topped with grated cheddar cheese. Walnut cake, made gluten free with a mixture of buckwheat flour and ground almonds, and using walnuts from Niall and Antoinette's trees. Apple snow, made with our own frozen fruit, and eggs and fromage frais from the laitière (local dairy farmer who delivers). What's Unusual About This Scene? 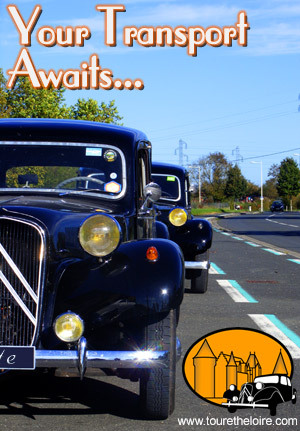 Early March sees the beginning of the season of outings and events for the classic car club that we belong to. These photos are from the annual swap meet (Fr. bourse) at Noyers sur Cher (just across the river from Saint Aignan). 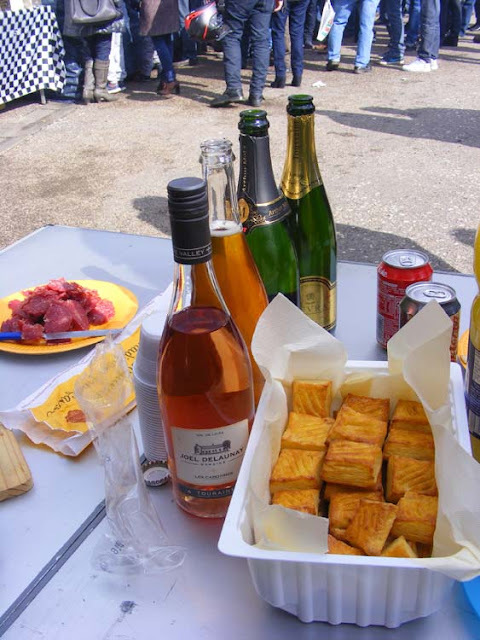 An aperitif for members who are attending is being prepared. The golden squares in the plastic box above are either goats cheese puff pastries or potato cakes. 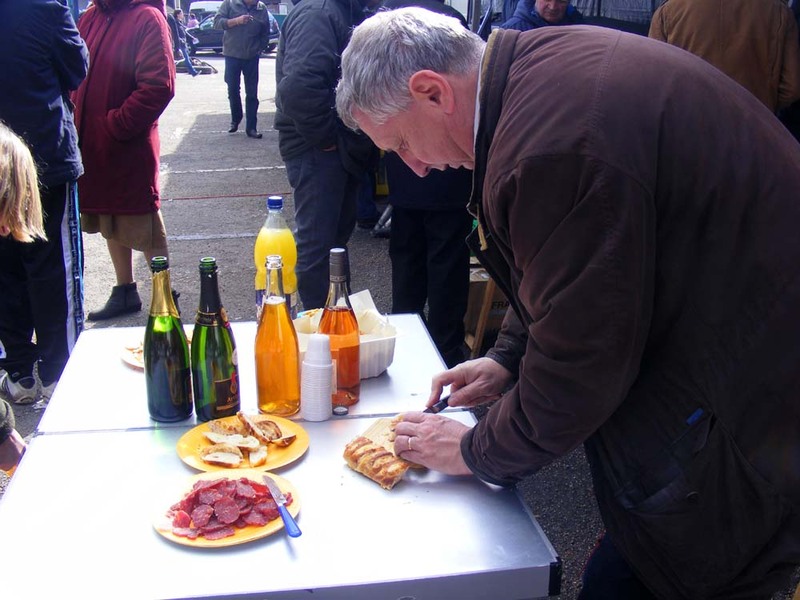 Below, the new president of our chapter of La Traction Universelle, Jean-Marc, cuts up a savoury bread. The drinks include some sparkling wine, some homegrown homemade pear juice and a rosé from Joel Delaunay. He is a winemaker from Pouillé, not far away from where this meet was taking place, and a lot of the club members buy wine from him. So what is it that is so unusual about this scene? What the Fulk is he Doing! ?